There May be Snow on the Ground, but there is “Spring” in My Step! It seems that Mother Nature got the wrong memo on Friday. Instead of sending sunshine and flowers for the first day of Spring, she delivered around 5 inches of snow. While the snow won’t stick around for long, according to the forecast colder than normal temperatures will be here for a while. In spite of the cold temps and Spring snow showers (which by the way were beautiful), I have emerged from the season of Winter blues earlier and stronger than ever before. The seasonal feelings of sadness and depression arrived right on schedule in late October, but unlike previous years, my spirits began to lighten toward the end of February instead of the end of March. There have been years in which the black cloud of seasonal depression didn’t lift until well into April. If you’re not familiar with Season Affect Disorder (SAD), it’s a mood disorder which is characterized by depression and it happens at the same time every year. It zaps your energy, makes it a challenge to get out of bed, and turns the world into a “glass half empty” kind of place. There seems to be a direct correlation with the lack of sunshine and shorter days and the onset of the feelings of depression. For me,they seem to creep in so slowly that I don’t recognize them until it’s too late. I find myself thinking, “wow it’s not going to affect me this year,” then the hammer falls and I find myself almost physically unable to get out of bed in the morning. Last year I discovered the value of light therapy in the morning and the evening. And I stumbled onto the benefits of having a creative outlet to occupy my evenings. Even with these tools to fight the negative feelings and lethargy, the winter of 2013 was one of my most difficult bouts with this condition. This winter I decided not to wait and see whether or not the inevitable would happen. I began using my lamp that mimics natural outdoor light at the beginning of October (before the feelings of depression started to hit me), made a conscious choice to do something creative every day, and registered for a drawing class to make sure I got out of the house. For the most part it worked. While I still experienced feelings of sadness, they were nowhere near as severe as in previous years. I believe one of the major benefits of my early and consistent treatment approach is that the cloud lifted sooner. 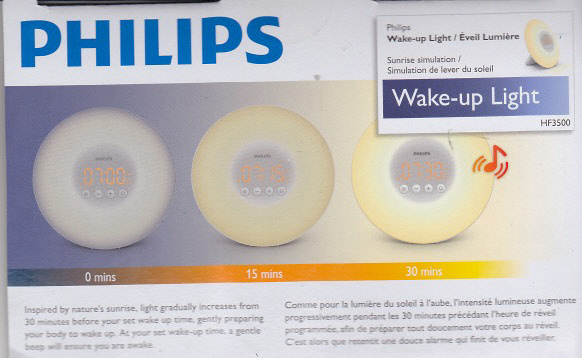 A few weeks ago I added a new tool to my arsenal, a natural light “Wake-up Light.” I very quickly became a fan. The light simulates the sun rising. The light starts to illuminate 30 minutes before the alarm is set to go off and by the time the alarm chirps, it’s fully lit. The theory is that the emulation of sunrise releases certain chemicals in the brain that say “it’s time to wake up.” I don’t know about the science behind it, but I do know that it works for me. I honestly believe that it’s helped to accelerate the earlier than normal exit of those pesky winter blues. The “Spring” in my step has motivated me to register for a half-marathon in June and exercise is once again a part of my daily routine.